14-year-old Quincy Jordan doesn’t want to travel to Crystal Bay to spend time with her newly discovered aunt, uncle and cousins. She doesn’t want to trade the excitement of Sydney for some hippie village on the remote coast. She doesn’t want to leave her exclusive all-girls private school and she definitely doesn’t want to leave her best friend Jules. Most of all, she doesn’t want to have to acknowledge that her dad has had an affair and her family life has changed forever. Despite Quncy’s protests, she finds herself in Crystal Bay in a world so different to the one she is used to, it just adds to her feelings of disconnection and frustration. Her father is silent, life for her friends in Sydney is carrying on without her and she is stuck in Crystal Bay, sharing a room with her three cousins and trying to block out all the hurt and fears. 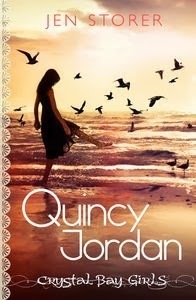 Quincy Jordan is the first book in a new middle fiction series for girls, Crystal Bay Girls, by Australian author Jen Storer. The novel balances more serious themes of marriage breakdown and damaged family relationships with friendship and just a touch of teen romance. The family relationships within the novel are quite complex, as families often are. There is the breakdown of Quincy’s parents’ marriage and her mother’s long time estrangement from her sister, Quincy’s aunt Tess. There is the pressure from Quincy’s parents for her to follow the career path they have chosen for her and the lack of warmth in her relationship with both of her parents. To balance this more intense emotion, there are less serious friendship dramas between Quincy and her cousin Esme, Quincy adapting to new friendships and the very different lifestyle of Crystal Bay, and, of course, the complication of a handsome boy who captures the attention of both Quincy and Esme. Crystal Bay Girls seems set to be a series for girls in the 11 – 14 year age range that offers some of the sweet romance and friendship dramas that they find entertaining, with enough substance to prevent the story becoming superficial – friends, family, fun, laughter, tears and just enough drama to keep the pages turning. The second book, Romy Bright, is scheduled to be published in July 2014.